64-bit Super Cubic and Super Simple Rig update! A lot of people are going to be happy now, as the 64-bit version of Super Cubic is finally available! A popular requested feature has been added; Super Cubic can now extract side angles from your pano as well. I'm charging a little bit of money for it, but the 32-bit version is still available for free. Get it quickly, it's 40% off for a limited time. My rigging system also has a pretty big update, lots and lots of new stuff in this version. Read the Release History to see what's new and fixed. Highlights are easier finger rigging, scalable rigs and tween slider. I have had many requests for the realistic fighter plane model I did some time back. I've updated the model for V-Ray, put in a nice animation rig with a very cool afterburner system. Check it out if you need a realistic looking jet. Finally, a cool little job I just did together with the good guys at VOID. I only had eight days to do the film from start to finish, but it turned out really nice for the short time spent. Do you need a sheep? I'm really happy to finally have a model on Turbo Squid again. I keep getting questions about purchasing my models, so I'm planning on putting a couple of them up for sale in the coming year. First up is a remake of the sheep I made for The Troll Hunter, and next up will probably be the F-35 fighter plane. I've added some new character design to the portfolio, with Rimi and a new TV2 nisse being the most recent ones. The short film is in its finishing stages now, with the last shots being sent off to render now in November. Because of that, the new Super Simple Rig update has been on hold for a short while. But the sheep model give a clear hint as to what you will expect in the next version! Some of you have also asked about a 64-bit version og Super Cubic. I have a working build, that seems to be working without problems. I want to add one requested feature to the plugin though before releasing it. The 64-but version is going to cost money, so be prepared for that too! Star Wars season is approaching, and I'm super-excited about The Forca Awakens (together with pretty much the rest of the world!). 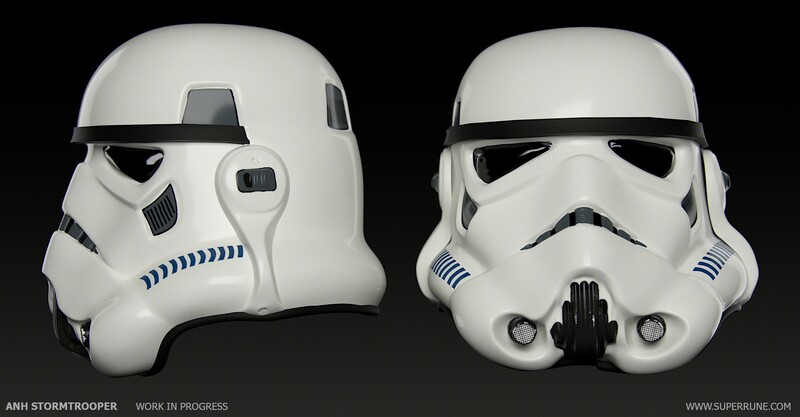 And I even had the opportunity to detail up the 3D Stormtrooper helmet I did way back. It's not painted yet, but should be super-accurate in terms of proportions. I hope you like it! This year I'm marking 20 years as a professional 3D artist, starting with my Funcom job in 1994. Looking back, I've done a lot of stuff, but I still don't think I've done my best work - or even done something where I've really stretched my muscles. I'm looking forward to see what the next 20 years might bring. There is a new version of Super Simple Rig inside the tools section. This version adds support for extra limbs, skin saving and has a couple of fixes and GUI improvements. I've also written some pretty extensive documentation for the system, and there is more to come in the future. I had to re-do the site backend to accommodate the Super Simple Rig documentation, so I decided to also give the site a makeover on the design front. I hope you enjoy the more modern look. I've also updated the gallery with more projects, both old an new, take a look! I have also remastered the TV2 nisse bumpers in HD. I improved some of the matte paintings and made tweaks to the overall look. Even though they're almost ten years old, they hold up surprisingly well. And with these bumpers, I wish you all a Merry Christmas! I put my Super Simple Rig online last week. This is a character rigging system I have been developing since late 2008, and used on every character project I've done since then. The system will see a lot of development in order to be ready for the short film, so take a look if you are a 3ds Max rigger/animator. And a site update too! I've done some minor design changes to the website, and will try and update the gallery as soon as I can. The site should be a little bit friendlier to read and browse. I have also added a list of my most popular pages on the left. Nothing big, but I hope it too will ease site browsing.